Be sure to visit regularly. There won’t be any comments direct on the page, but feel free to place predictions you come across or comment on predictions here. I’ll transfer interesting ones to the Predictions! page which you can find on the top links bar or left side links bar under ‘pages’. There are four already up there. BTW Richard Holle aerology.com/national.aspx Link not working. IPCC AR4 : Himalayan glaciers could be gone in 2035. Is the northern hemisphere heading for a massive winter? Nice article Geoff. I have to tell you and Dirk though, the predictions page is for hairy chested, colours nailed to the mast, definite predictions only. No namby pamby ‘maybes’ ‘coulds’ ‘strong possibilty of’ or ‘good chance that’ will qualify. So I’m afraid posing a prediction by asking a question isn’t going to cut it. Hey! Nice one Goeff, that qualifies, two predictions in one post! Hi ya Bloke… Neat idea! How about this… my prediction for the next cycle: Lucifer goes walkin’ 2016-17, a bit in 2015. Global warming crowd has a clustergasm. Gotta love Ulric, I too see a Murphy winter, but 2019, after larger VEI eruptions and another shocking low minimum to come. Snap back to our senses. Oh, ok, think we’ll get enough volcanoes to keep things fairly cool until mid 2015. Then comes the searing heat from a lack of eruption volume and the dryness from a long windy solar maximum of about a 100 ±10. The geological record suggests that solar minimums and a weak earth magnet gives rise to nasty earth quakes and even nastier volcanoes. My prediction is hang on to your hats and get ready for cold. My other fear which I feel may be a reality will be millions in serious need of help. Current news in the SH. We are in opposition on the NH winter but agree on a big wet for southern Australia this summer. This is quite common with a La Nina coupled with a positive AAO pattern. This year we are pointing at a very large La Nina and the AAO now measuring its highest since records began in 1979. These conditions could be quite normal during times of low EUV that is associated with grand minima. Is it possible to correct? used to be. Wear protective clothing and sun screen if needed. Always wear a light colored hat if you have to be out in the sun. [reply] Posted. It’ll be interesting to see if you and Richard are both right or wrong on this. I predict Leif Svalgaard will be wrong on three fronts. SC24 will not be a grand minimum cycle. The L&P theory is real which will demonstrate a gradual reduction where sunspots will disappear around 2015. Solar output has little of no effect on climate. Ulric, that reads like a good novel. EUV is fully absorbed by the upper layers of the atmosphere so is not likely to be measured by “home equipment”. EUV is measured accurately by SOHO and is currently showing very low levels, the thermosphere is also at record low levels. Just for fun, I’ve added the NOAA prediction. But with a reduced ozone layer as a result of low EUV, it may be possible to achieve higher levels of UV at the surface even if the overall level of UV emitted from the Sun is down. I think there is much to learn in this area. As if I didn`t know, I saw that reply coming a mile off! So it obviously is not imortant at the surface, which is why I shifted the point towards UV that is reaching the surface, and is measurably causing heating, get it? Thanks Ulric, added into your previous late summer forecast. I would say things look fairly positive for extra-tropical Alantic hurricane activity this Autumn in the UK. 23yrs can be a good `string` for certain weather events. This is not a definite prediction, but worth considering. September 21st through 24th 2010 will see the bigger set of conjunctions that will do a much better job of driving the intensity of resultant global tropical and extra-tropical storms, that form on the discharge side of the ion flux patterns, after these dates. No the season is not over yet. With the continual decreasing electromagnetic coupling as the Earth moves past these outer planets the severe weather activity levels, will drop with continued attempted recovery enhancements at the lunar declinational culminations, until by the time of the synod conjunction of Venus and Earth on the 29th of October 2010, we will see a last hurrah, then a slow shift into the storms of a deep cold NH winter. Did you get the Tinsley papers I sent you OK? I got the Tinsley paper fine still haven’t got a chance to read it yet, still in the social meeting friends stage of arriving in Arizona, loaded updates to software and net applications, down loaded the ACE data daily files from FSU and about 14 to 16 large pdf files I had bookmarked to download when on high speed connection. Organized the myriad of loose bookmarks I have saved but not filed, into new folders and sorted the obsolete ones into the trash and replaced with new. Downloaded 16,000 frames of SOHO solar photos to include in the movie formatting I want to do, still need to find GOES photos at close time spacing and image quality for the movie idea, email sent to NCDC asking for ftp download site, or pricing of the GOES data set, no response yet, but is still the weekend. Daughter has loaded up some new image handling software, and lots of her cd collection of music onto my computer for me. To answer your question about the forecast it is just a detailed step by step statement of what I thinks needs to happen, to verify or falsify my basic hypothesis, and at the same time stick my neck out past my brass balls with the detailed strength and dates of occurrence to get all three of them axed in one swipe….But if it verifies well…. A busy period for you, thanks for finding the time to post your comments here. We’ll be watching with keen interest as the hurricane season unfolds. My prediction is GISS will continue to adjust its temperature record; where do I collect my first prize? Been watching the decay of Danielle as she ingested that large mass of cool, dry, deionized air, and she was just gutted, stopped the rapid precipitation trend dead. I think this might be a mass of recharge effects from the earth passing Neptune, and Mercury getting ready to pass the earth, shifting the [HPGP] “homopolar generator potential” charge from pole to equator, from a discharge pattern back to a recharge pattern, it will stop, prevent, or slow the growth of Fiona, as it tries to push more +ions back into the atmosphere. Earl might just get killed, the same way, as Danielle did, as he runs into the frontal boundary as it pushes off of the EC of the USA. Normally the NHC does not see these HPGP charge shifts, [we seldom have rapid multiple outer planet conjunctions] so they will expect to see inertia control the path and growth of Earl and Fiona (still not a TS). I think there is a possibility that Earl will just fail to grow and wither and die when it meets this out wash of deionized cool dry air, that i think will just dilute the precipitation driven trend by the ion flux, that makes these storms grow, shift to a pattern of wither and just die. So what if Earl just quits like Bonnie and Colin did as they faltered and did not develop? NHC, NOAA do not foresee that as a possibility, from their forecasts they will continue on up the eastern seaboard, spreading death and destruction. IF this recharge withering of these storms occurs then the intensity comes back post September 21st, I would want to find the trail of evidence that leads back to the electromagnetic mechanism that drives the process. IF I am wrong and no stalling of energy flow occurs as Earl runs into the front, well I need to do more thinking. Loop showing the brown air mass incursion. Using a 179 year look back for the location of volcanic activity has worked this October, with a return of new eruptions in Indonesia as predicted. Ulric Lyons predicted on Aug 2, 2010 floods in the southern hemisphere in the warmer months. There have been large floods in December in North Eastern Australia and are still continuing now in Victoria in the South east of Australia. At the same time there have been floods in Brazil. Good prediction but of course the loss of life is not welcome. Ulric should do a post to clarify his prediction. of actual numbers and specific places. Then do a score card, public. Relax, let your hair down, have some fun, make a prediction. I was thinking of making up some PASS and FAIL images in green and red to slap on the predictions once we’ve mulled over them together. That’s about as far as I’ll be going with it. Dropped a copy of this spring’s March /April tornado forecast I made over on WUWT into the predictions page. 4-8/13 Maps of the expected precipitation can be found on my site, bearing in mind that the tornado and severe activity usually forms in the fast moving part of the narrow frontal boundary, and not usually in the areas of heaviest total daily precipitation. How’d that prediction work out? [Reply] I updated it in august to move the low point to this September. So, a fail for feb from the previous June, and pending judgment in sept from last aug.
[Reply to reply] How’s it looking for your prediction for this September? [Reply] Pretty good so far. People will contiune to be stupid. A couple of medium term predictions..
1) The IPCC estimate of climate sensitivity will fall. Specifically, it will be lower than 3C/2xCo2 by AR6. 2) The IPCC FAR BAU prediction of a rise in temperature of 0.3C per decade will remain closer to 100% wrong than right. Specifically for at least ten years. [BAU will continue (Carbon emissions will continue to head towards 12GtC by 2025). In other words, the temperature rise will remain 50% too high. This is also significant because the multi-scenario ‘best guess’ in AR4 (ignoring the joke scenario B1) is, coincidentally 3 degrees by the end of the century. Therefore, AR4 will also be nearer 100% wrong than right, but that is a more long term prediction. I’ll leave that open-ended, but it is still a prediction – AR4 will be just as wrong as FAR, which means someone isn’t learning their lessons!!! P.S. If anyone wants a friendly £10 wager (or more..) on 2) I suggest using Wti temperature index, 1990 to any time in the next ten years. Apologies for a lack of clarity in 2) – A sentence seemed to vanish in the ether.. I predict the rise in temperature will remain 50% too high ie nearer 100% wrong than right. I predict the rise in temperature, from 1990 will remain below 0.2 degrees C per decade, thereby making the IPCC prediction of 0.3 degrees C per decade more than 50% too high. In other words, nearer 100% wrong, than right. I hope that’s a little clearer..
[reply] WordPress interprets the greater and less than symbols as code delimeters. Thanks for the predictions! 7) Surprising one…. Co2 increases will never exceed a 5 year average of 3ppm per year. 8) 21st century Co2 concentrations will increase by less than 200ppm. 9) A token safe short term prediction – 2012 will not be the warmest ever. Contrary to Anteros’s assertion (Dec. 10, 2011 at 4:32 pm), the IPCC estimate of climate sensitivity cannot fail. The “climate sensitivity” is more precisely termed the “equilibrium climate sensitivity” for by definition it is the increase in the global equilibrium surface air temperature for a doubling of the CO2 concentration. As the equilibrium temperature is not an observable, the IPCC’s estimate cannot fail. The IPCC’s fault does not lie in the magnitude of its estimate but rather in the fact that this estimate cannot fail, for the insusceptibility of the estimate to failure by reference to instrument readings places this estimate outside science. I think this is a consequence of the Talkshop’s tiny writing. I predicted the IPCC’s estimate of climate sensitivity will FALL (not fail). Tornado prediction for spring with mention of heavy snow and ice storms as well, posted on WUWT. Solar cycle 24 appears to be peaking and the recent La Niña has just ended. 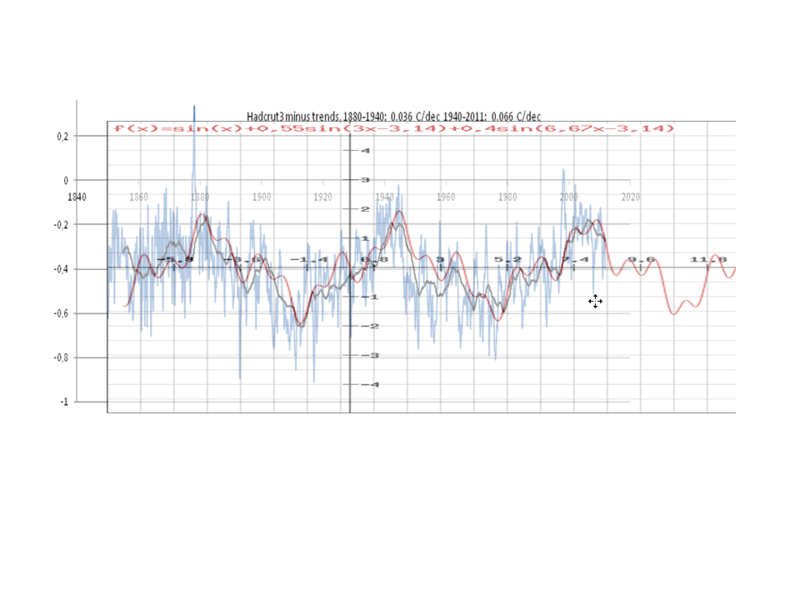 The peaks of solar cycles 22 and 23 also coincided with the end of a La Niña. During cycles 22 and 23, however, upward shifts in SST, SAT and TLT occurred during the transition out of the La Niña, and this time there’s no sign of a temperature increase. So I’m going to go out on a limb and predict that the current no-global-warming trend will continue at least until the next solar minimum. Even with a neutral 2012/2013 ENSO the record (especially with Hadcrut4 coming on line to ‘help’ the figures upwards a bit) is ready to be broken.. An El Nino would make it absolutely certain..
Roger Andrews – Fair point 🙂 That was partly the reason I mentioned ( a bit obscurely perhaps) the WoodForTrees index which averages the Hadcrut/Giss/RSS/UAH datasets. I use it generally to avoid the whole topic of cherry picking and I’m not usually concerned (apart from for wagers!) with short term trends or ‘records’..
My reasoning is that unless there is a triple-dip La Nina, there is probably a better than even chance of the WTI data showing a new record… I’m not necessarily saying it means very much! Just wanted to have a 2012 up there in predictions. I wonder if you and your readers would interested in the following table of predicted Sunspot Cycles up to the year 2174 taken from our Solar Chord Science site. I would happy to provide in depth examination of how this table was produced later. 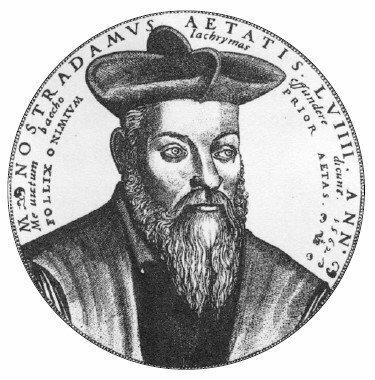 Please note that two of the predictions have been validtaed, 2006 and this method was also used to determine the missing cycle that commenced in 1793 since verified by the finding of original data sunspots records from that era. The next cycle change is 2016, NASa is saying 2020, only four years to wait and see if it’s three in a row for SCS! [Reply] Hi Miss S. Could you tell us more about your prediction method so people can judge how seriously to take your prediction please. Hi again and thankyou for wanting to know more. My predictions come via my mother who is in spirit…she comes to me in my dreams and demands I pay attention. She basically haunted me until I left Christchurch and has let me know of the total devastation that is to come. I have told many, many people not to buy property in Christchurch and especially so near water. I have seen the future since I was a little girl and it has not always been an easy road for me. I was able to get my son in law out of ChCh prior to the 22nd Feb quake which my mother warned me of a few days ahead. She recently came in and showed me that my partner was going to have a heart attack, which happened out of the blue and very unexpectedly. What she has said about ChCh in particular is that the focus will be in the north, but it is the wrong island. Her message is that everyone is back in time for the big one…something upsets the main divide and all hell breaks loose. I have managed to get get some of my friends to leave ChCh and I just want to be able to let people know this so they can make some decisions of their own. I have seen a very very large earthquake out at sea which creates water devastation. It scares me. This winter will see the arctic sea ice breakthrough into positive territory and the global sea ice go positive by 500,000. Moderate-Intense geomagnetic storm in progress. Solar wind> 600km / s.
Sw 6 and volcanic eruptions northern hemisphere. Monitor the solar wind !